Making meaningful connections through your social space will help establish and continue to re-establish loyalty with your customers. 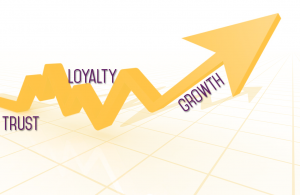 Behavior of a loyal customer includes not only making a purchase but making purchases more frequently and in higher quantities. Loyal customers also do not consider the many alternatives that are available to them. Leveraging your social media can allow your business to grow when your biggest fans are recommending your business to their following. Consider how relationships are a two way street. You will get the most out of your relationship with your consumers when you are attentive and engaging with them–not just posting to them. Read about our additional services.